I will be sharing the trials and tribulations of being an instructional coach in a K-8 1:1 school district. I hope to showcase how teachers are using technology to meet standards and keep kids moving forward. I will also be sharing my experiences of building relationships with teachers in order improve their teaching practices and move them Above the Line. This past week was an exciting one. I worked in a 4th grade classroom all week. 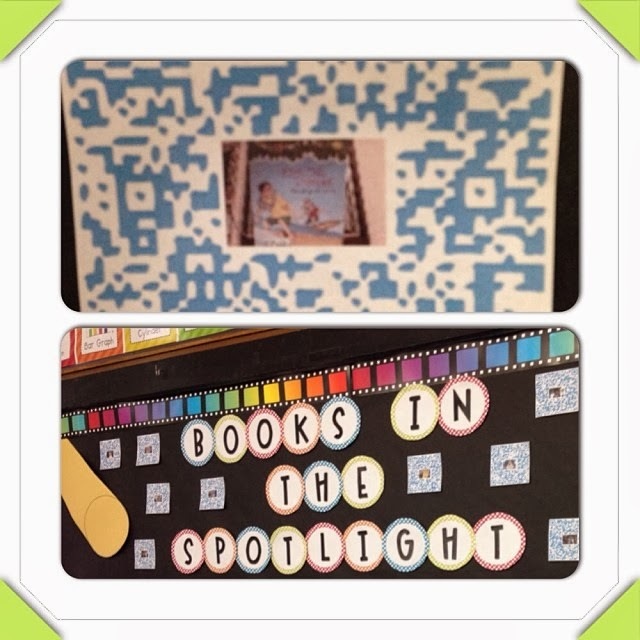 We created book trailers and published them using QR codes. When the QR code is scanned, a student book trailer can be viewed on any mobile device. Although the explanation is long the process is simple. The students did a phenomenal job producing and publishing their own videos. First, each student read a book on their reading level. The classroom teacher provided a script that included: title, author, setting, problem, and recommendation. The recording also included a hook like, "To find out more read this story." Next each student recorded themselves in iMovie. This could be done in Quicktime or Windows Movie Maker too if you don't have iMovie. They took a picture of the book's cover using Photo Booth. I taught them how to do cut aways using their book's cover. A cut away is just that - the movie continues while the viewer sees the book cover (or whatever still picture is inserted) while still hearing the students voice telling about the book. There are many videos about how to do a cut away, but I have found this one most useful Book Reviews in iMovie by CrunchEd Productions. This video can be posted on your class website for students to watch over and over again till they understand the process. You could always make your own screen cast, but there are so many videos available why would you reinvent the wheel? Once students were happy with their movie we had to save them to somewhere where they could be shared. We use Google Apps for Education in our district. Each student has their own Google Drive account. We logged in and uploaded our movies to Google Drive. Next, we used Unitag QR Code generator so that we could put the book cover into the middle of the QR code. We copied and pasted the Google Drive URL and uploaded the book cover photo to the generator website. Make sure you change your share settings in Google Drive to Anyone with the Link. Otherwise the QR code can not be viewed. Almost done - students dropboxed the file to their teacher, she sized them and printed them out! The picture above shows one of the QR codes and the bulletin board where all the QR codes are posted. The students enjoy clicking on each others codes and listening to their classmates book review. The key now is to get students to read the books that were reviewed. Stay tuned ~ this week, this same class is going to use augmented reality to do biography book reports. Love the blog post! Looking forward to reading more!